Rocket League marked its first anniversary in early July with the release of the physical Collector’s Edition that celebrated what a hit the game as become. Originally released as a digital exclusive, the indie game has seen the addition of multiple game modes, quite a few arenas, and plenty of downloadable content (DLC). While we won’t be covering the paid DLC in depth due to the sheer quantity, rest assured that none of it gives a distinct advantage over those who only own the base game. Often described as easy to pick up but insanely hard to master, Rocket League has forged its way into the hearts of gamers around the world. While it isn’t posting Call of Duty numbers, the hit indie game boasts an all-time high of 239,000 concurrent and 19 million overall players. As one of the few games to feature cross-play between PlayStation 4 and PC as well as Xbox One and PC, there’s little doubt this game has a bright future. Rocket League is the sequel to Supersonic Acrobatic Rocket-Powered Battle-Cars (SARPBC) and features the same gameplay mechanics as the original. Players drive (and fly) battle-cars around the field, aiming to score goals in literally any way they can. While the game is easy to pick up, it can be incredibly hard to master the more complicated styles, like freestyling and actually scoring. Games can be as short as five minutes while tied games that enter overtime have no set time limit. Beginning players can get a feel for the game in various training modes as well as the offline Season mode, the equivalent to Campaign mode. As players advance, they’ll develop more skills, including dribbling and, possibly the most complicated aspect of all, aerialing. Be warned: while Rocket League is a physics-based game, it isn’t without its bugs or connection problems. Thankfully they’re few and far in between, allowing for smooth gameplay all around. I had never played SARPBC so I was brand new to Rocket League, picking it up for free during the July 2015 PlayStation Plus promotion. While it was plainly obvious who had made the transition from the first game in the beginning, the field has leveled out for the most part, creating a fun but competitive atmosphere. While I’ve likely played more than the average player, coming in just shy of level 62, there’ still plenty to learn and do. Suffice to say, Rocket League is incredibly addicting. Fortunately, in this crazy game, there’s always room for improvement. Combined with short matches, a relatively bug-free experience, and plenty of competition, Rocket League is perfect for both short and long gaming sessions. At launch, Rocket League offered players eight arenas…all of which have the same dimensions and four total settings with varying times of the day. Many players, including myself, grew tired of the base arenas within two months of the game’s launch but Psyonix was quick to rectify the issue. Utopia Coliseum brought a fresh look to the game, albeit bearing similar, if not exact, dimensions to the preexisting arenas. Wasteland was the first game-changing arena thanks to the inclusion of a slight incline toward the center of the field from either side. While it was far from a fan favorite, the arena was a refreshing addition to the game. A more recent update corrected the bounce patterns, giving players something else to take note of and adapt to. Arguably the most imaginative additional arena came in the form of Dunk House. A basketball court-style arena, Dunk House featured a net on either side of the field. Complete with realistic sound effects, floor squeaks and all, the arena and accompanying play style is currently contained in the Hoops playlist. Neo Tokyo is the most recent addition to the game and is based on Underpass, a field that made the step from experimental to official arena not long ago. Featuring two raised ledges on either side of the field, the arena boasts a higher ceiling and plenty of flashing lights and colors that are sure to appeal to the eye. Cosmic, an old fan favorite, Utopia, a circular arena, and Pillars, named for the pillars in the center of the field, currently reside in the experimental Rocket Labs playlist. Double Goal is available in private matches but left public playlists with the June 2016 update. Why Psyonix removed Double Goal from the public rotation is beyond me but it was a personal favorite and I’d love to see it return. A new octagon-shaped arena, christened Octagon, will debut in the Rocket Labs playlist come September. 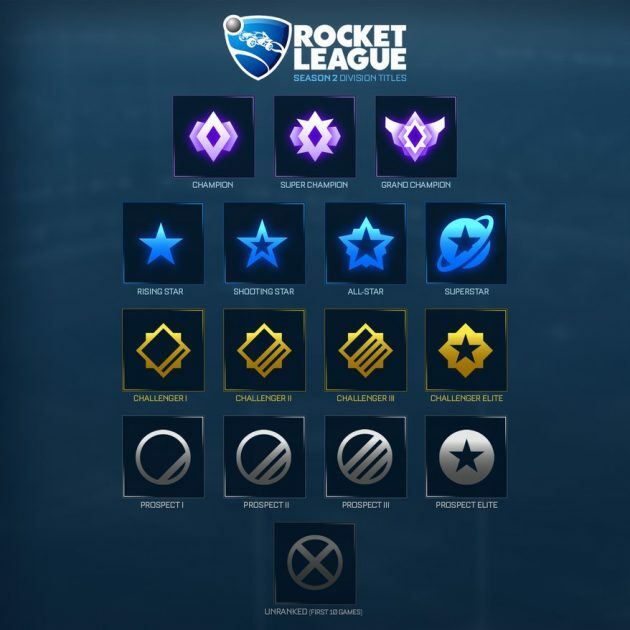 Rocket League features both Ranked and Unranked categories, each offering different playlists and game modes. The ranking system provides more competitive players the opportunity to test their skill against one another. With a recent update, players can no longer party up with a lower-ranked player in order to play opponents far below their rank. Instead, parties will now be matched with opponents according to the highest-ranked player’s skill level. Ranks range from Prospect I to Grand Champion. Some options are only available in private matches. Solo – A one-on-one playlist that allows players to test their individual skill. Doubles – A two-versus-two playlist that allows players to pair up and test their teamwork. Solo Standard – A three-versus-three playlist that prohibits players from playing in parties. Every player is paired with two random teammates near their skill level. Standard – A three-versus-three playlist that allows up to three players to join a match as a party. Solo players may search in this playlist as well. In addition to an active Ranked category, Rocket League’s popularity has spawned an ever growing professional circuit. Among the competitors are SARPBC veterans and newcomers alike. The most popular teams of the bunch are iBuyPower Cosmic in North America and FlipSid3 Tactics in Europe. The first-ever Rocket League Championship Series concluded this past weekend and was full of comebacks, upsets, seemingly-impossible plays, and the like. In the end, iBuyPower Cosmic took home the championship title and their share of the $55,000 prize pool. Solo, Doubles, and Standard remain unchanged from the Ranked playlists. Chaos – A massive four-versus-four playlist that allows random solo players and teams alike to clash, often resulting in absolute chaos. Snow Day – A hockey-based playlist and game mode that features a hockey puck instead of a ball. The puck is somewhat magnetic to the walls and ceiling. This game mode is played on an ice rink in appearance only. Hoops – This basketball-based playlist offers players a new way to change up the game. With a net on either side of the field, a jump ball instead of kickoff, and realistic-sounding basketball court, this playlist is largely different from any other. Announced at the Rocket League Championship Series, a new Rumble playlist will make its way into the game soon. While it is rather difficult to describe as we really don’t know many of the specifics, Psyonix did release a trailer that gives players a good idea of what to expect. Mutators – By entering a private match, players can edit the default options to their heart’s desire. Options include ball weight and size, gravity, boost amount, demolition settings, and more. Paid DLC and all, Rocket League currently features 25 different rocket-powered battle-cars with more to come in the future. Of these, one is exclusive to PlayStation 4 and two are exclusive to the Xbox One. In total, that’s 11 and 12 base vehicles respectively. None of the exclusive vehicles are available on PC, leaving that platform with 10 base vehicles in all. Every vehicle’s paint color is customizable and players can add a topper, antenna, boost trail, wheels, and paint job to the vast majority of vehicles. 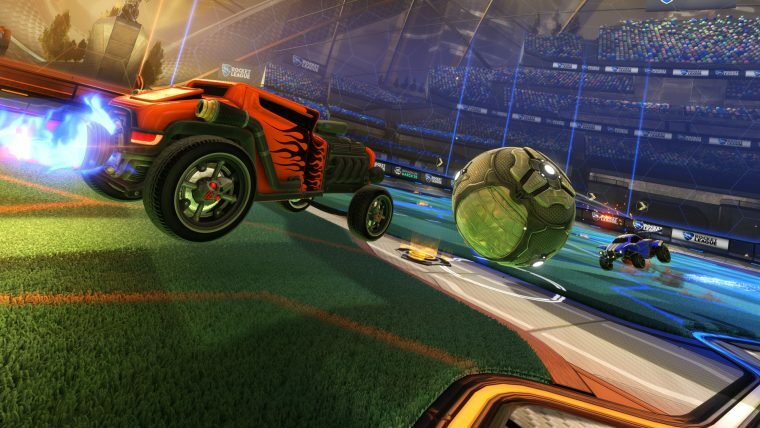 With more free content to come, Rocket League is bound to continue garnering interest from players around the world. Even better, the game could become the first of its kind to support cross-network play between the Xbox One and PlayStation 4. With pricing starting at just $20 for the digital version, Rocket League is a game that provides hours upon hours of entertainment with little to no downside. As long as Psyonix continues to support the game like they have over the past year, odds are that this hit indie game isn’t going anywhere anytime soon. Rocket League still has a few kinks to work out, such as lag-driven half flips, which is why it falls just short of a perfect score.